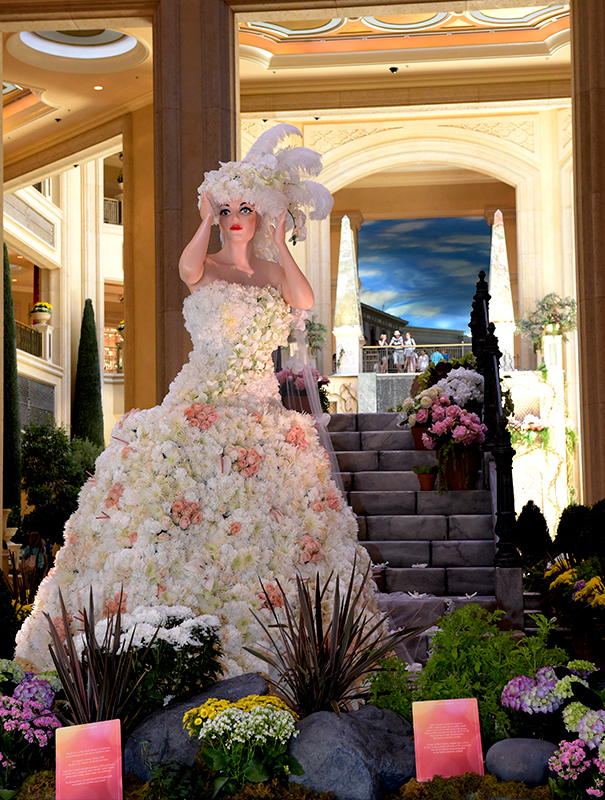 Summer is in full bloom in Las Vegas as two resorts create magnificient installations featuring thousands of fresh-cut flowers. Photography by Glenn Pinkerton and Sam Morris of the Las Vegas News Bureau. 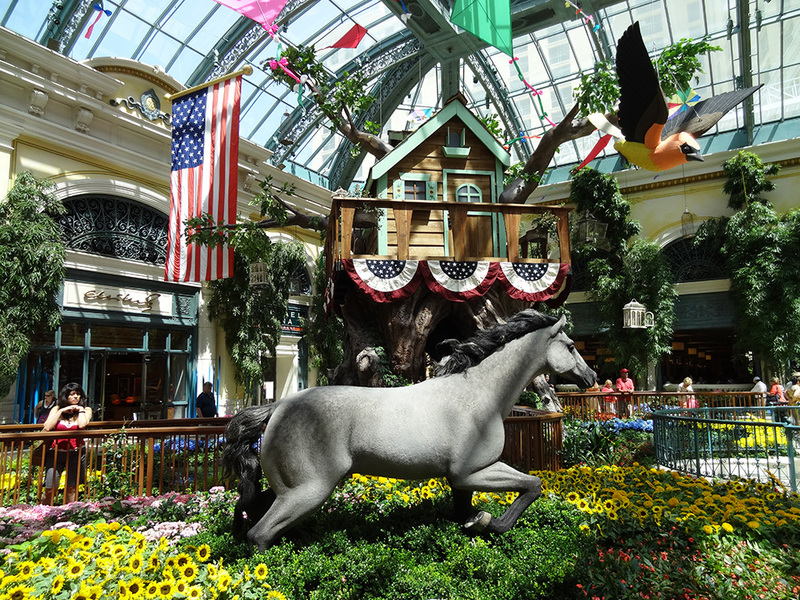 Inspired by the elaborate costumes and decorative masks of the Carnivale di Venezia, The Palazzo Las Vegas has transformed its lobby atrium into a scene from the festival. 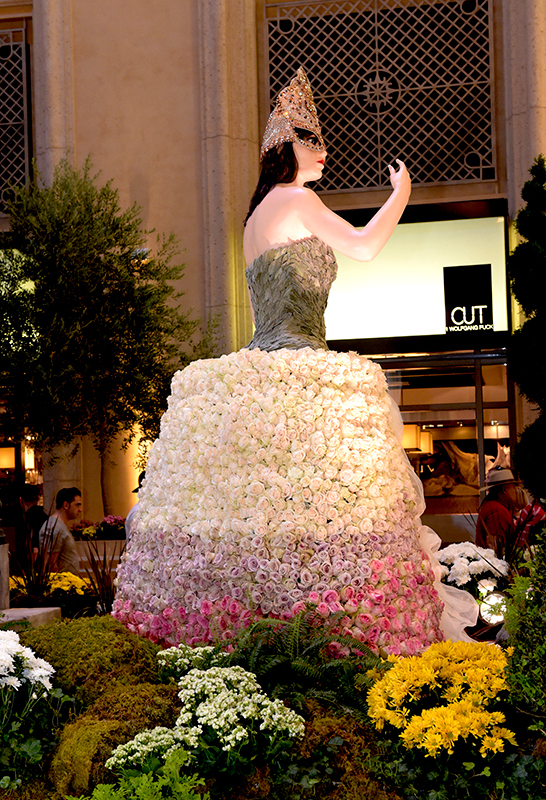 The focal point of the floral installations in the Waterfall Atrium and Gardens and in The Palazzo Lobby are Venetian women topiaries that stand nine feet tall. 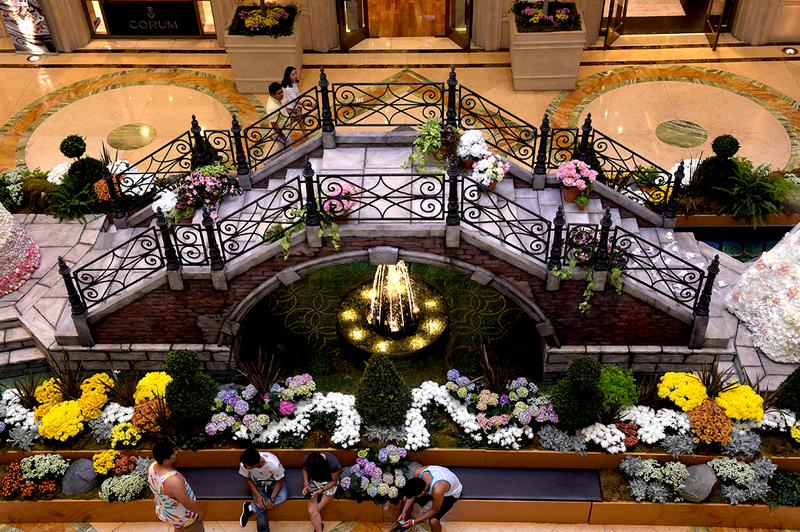 The topiaries were created by a 3-D computer, similar to CG models used in movies. Melding the world of art and mechanics, the bodies of the topiaries were built with aluminum pieces cut using Computer Numerical Control and then hand-finished by a sculptor. 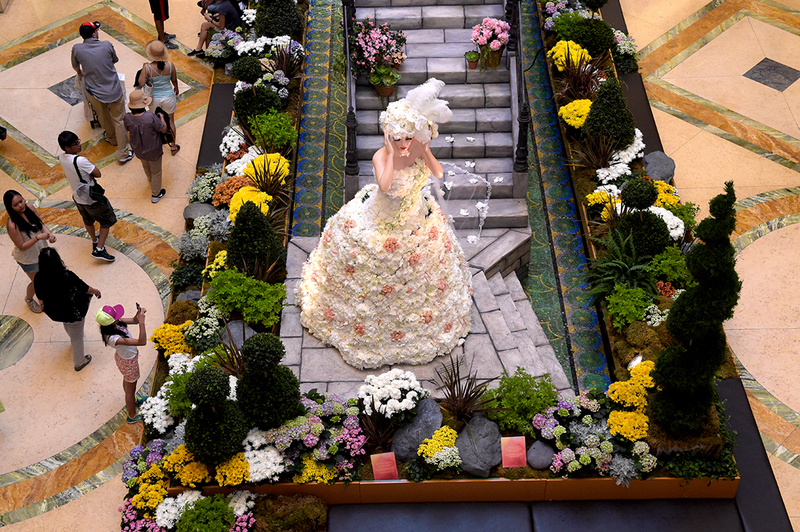 The dresses of the topiaries were built entirely by aluminum plates with slots to hold florist foam and the tens of thousands of flowers that make the Venetian-style dresses. 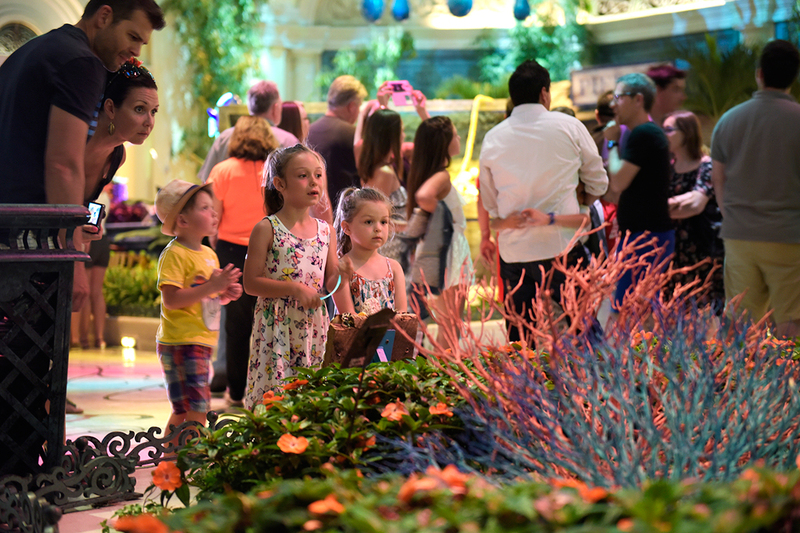 A team of 20 floral designers, gardeners, and engineers contributed a total of 1,200 hours toward the installation of the summer floral display. 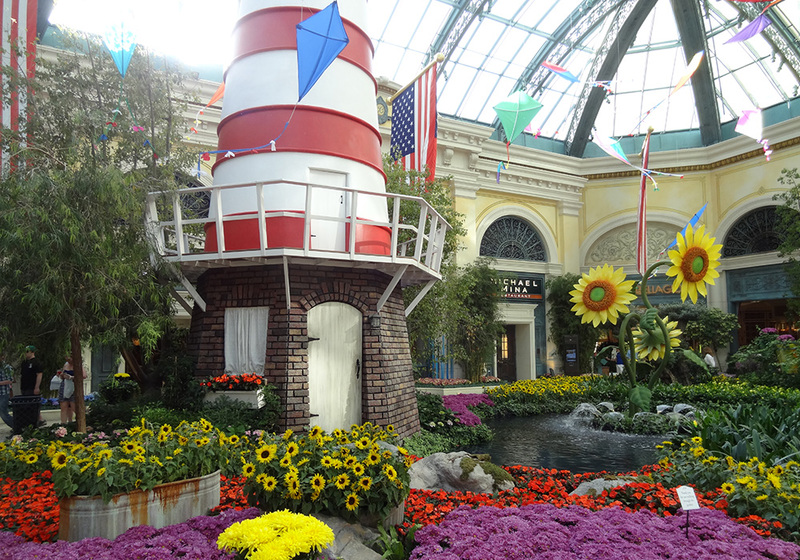 The installation can be seen through Sept. 1, with the décor and colors changing throughout the summer months. 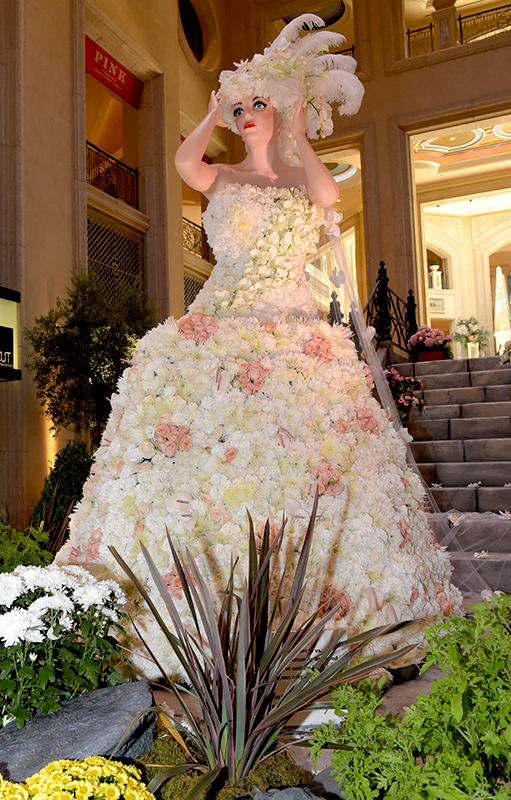 For June, a touch of wedding glamour will be seen throughout the display with shades of white, pinks, peaches, and creams. 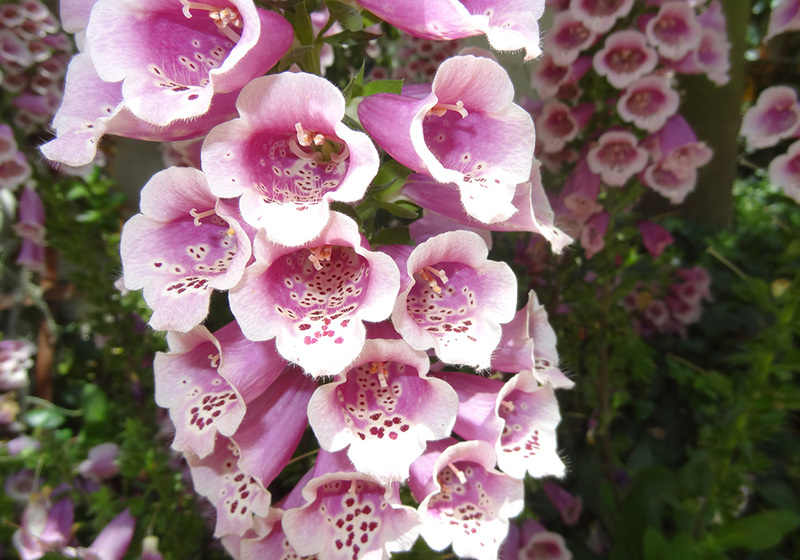 In July, hot summer nights transform the gardens with jewel tones in hot pinks, purples, and reds. 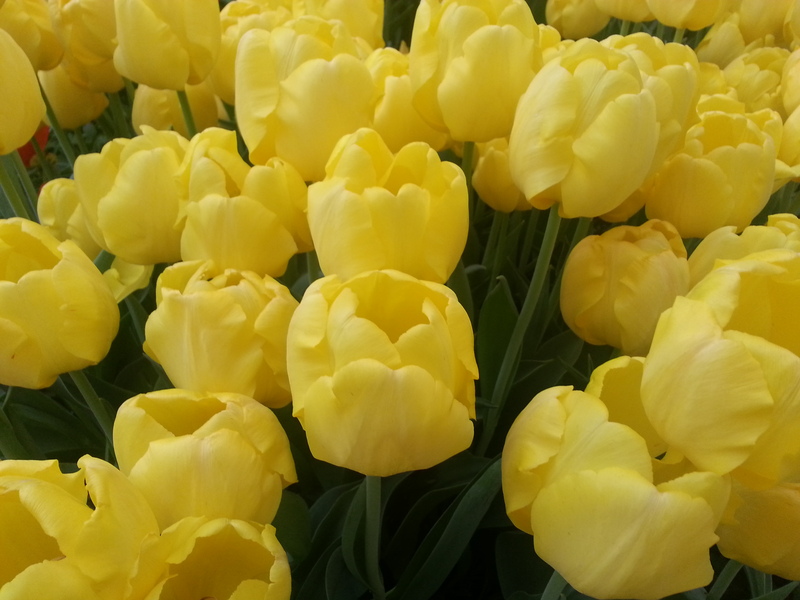 And in August, to finish up the three-month show, the gardens and topiaries will begin to show the transition into autumn with orange, yellows, reds, and browns. 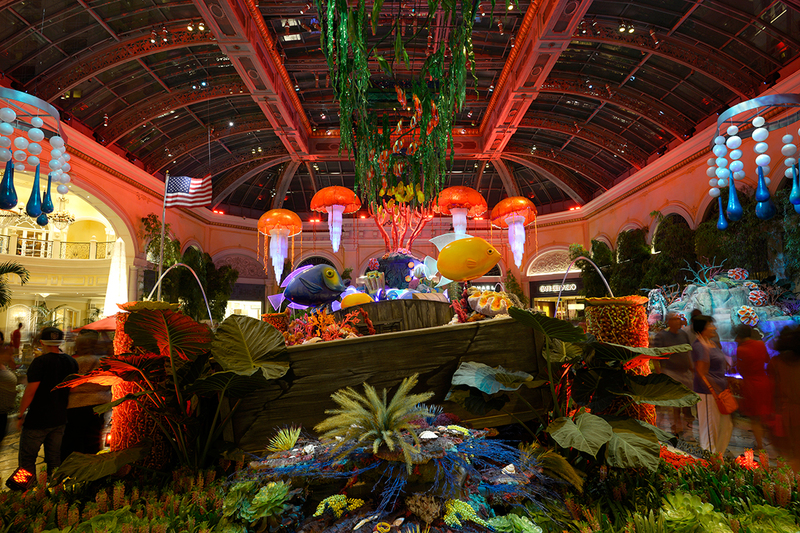 The Bellagio Conservatory and Botanical Gardens’ newest exhibition takes guests under the sea and into the depths of the ocean. 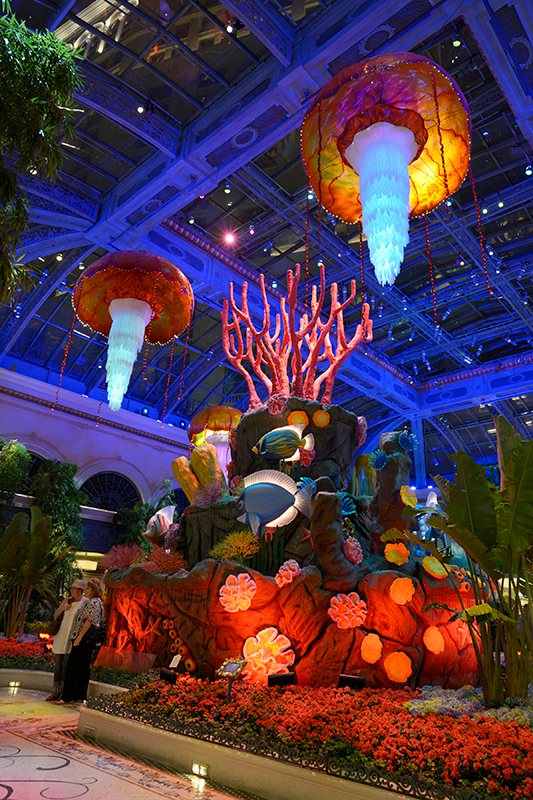 Schools of acrylic fish and bright barnacles find a home amongst the cascading water walls of a multi-tiered, 26-foot tall coral reef in the West Garden. 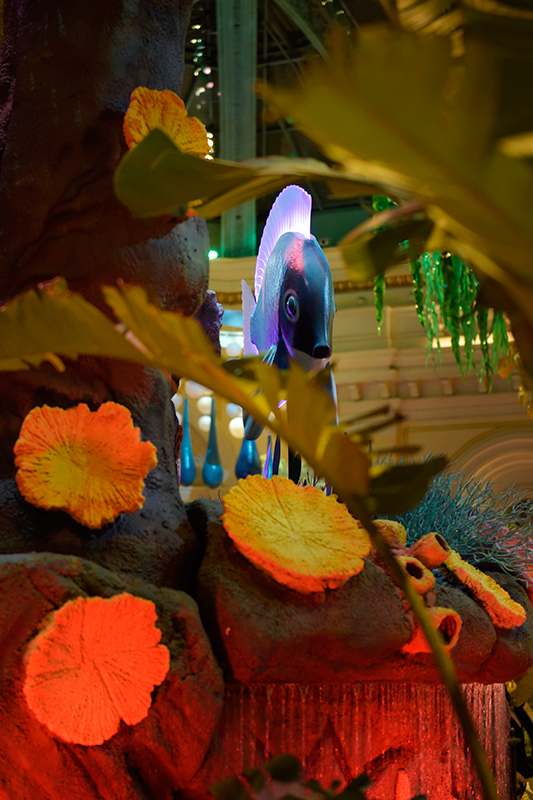 Each level of this magnificent centerpiece reveals a different group of underwater dwellers. 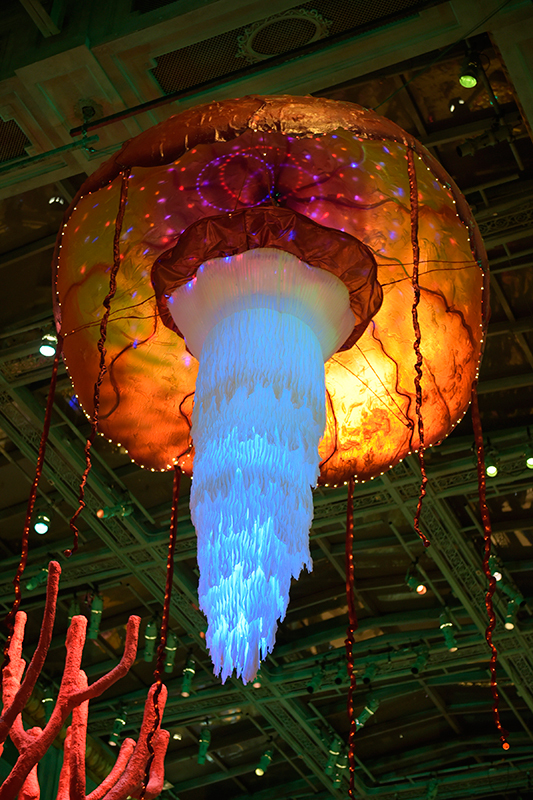 A six-foot animated clam rests beneath the schools of fish and bunches of colorful coral, opening every seven minutes to reveal an illuminated pearl behind a curtain of bubbles. 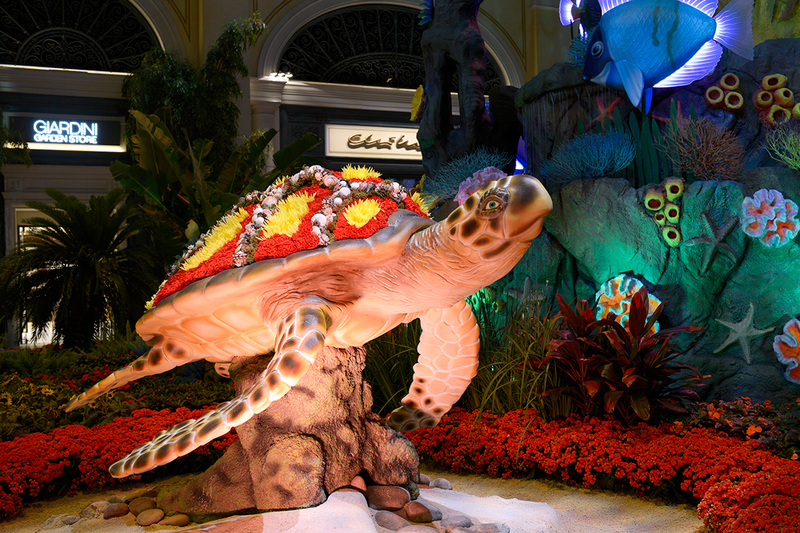 A floral sea turtle comprised of red carnations and yellow Fuji mums rests opposite the clam, while soft and delicate jellyfish gently sway above the garden. 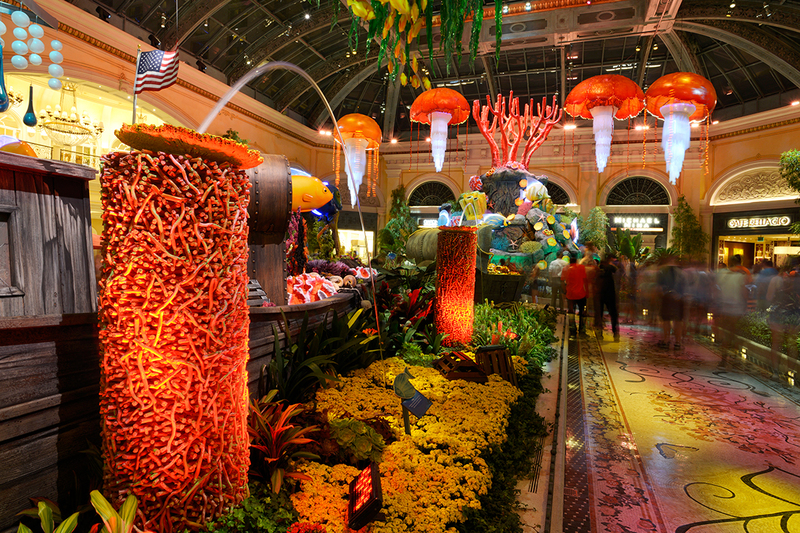 An aged fisherman’s wharf, aptly named Pier B, can be found in the South Garden beneath oversized strings of pearls and bubbles. Three children play in the sand beside the pier, each created with 1,250 fresh-cut flowers including Seafoam Statice, cushion mums, carnations, lavender and baby’s breath. As one child builds a sandcastle replica of Bellagio, the others fish and play with beach balls. A sunken fishing vessel made of teak, mahogany and cedar wood is burrowed below the sand and flowers in the East Garden. 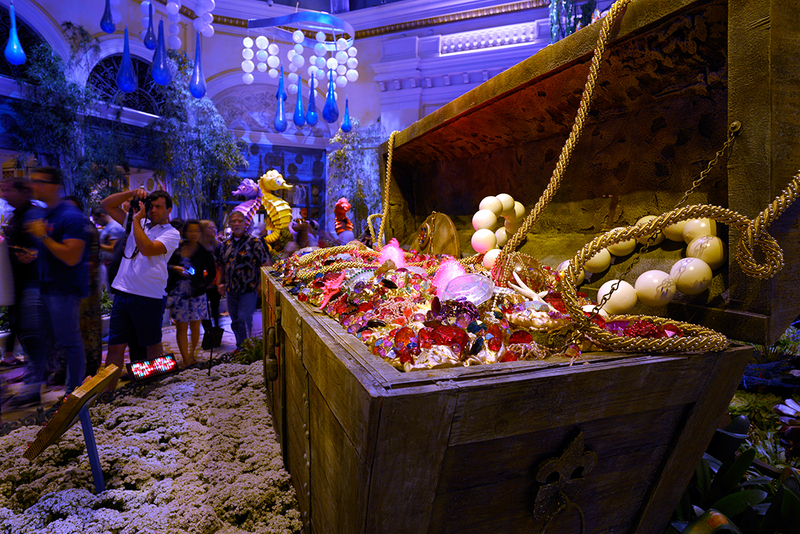 Treasure chests overflowing with twinkling jewels and riches surround the sunken ship while multiple water features mimic the ocean current. 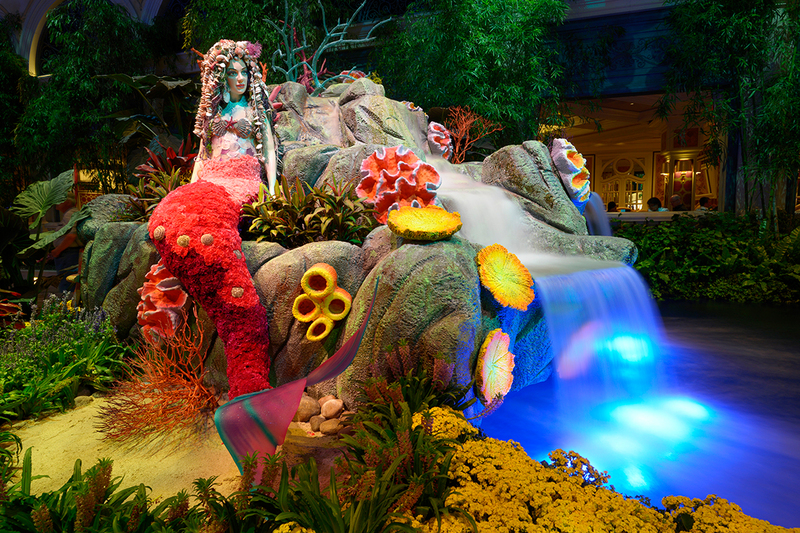 In the North Garden, a beautiful mermaid with 1,500 fresh-cut flowers in her tail sits aside a flowing waterfall. 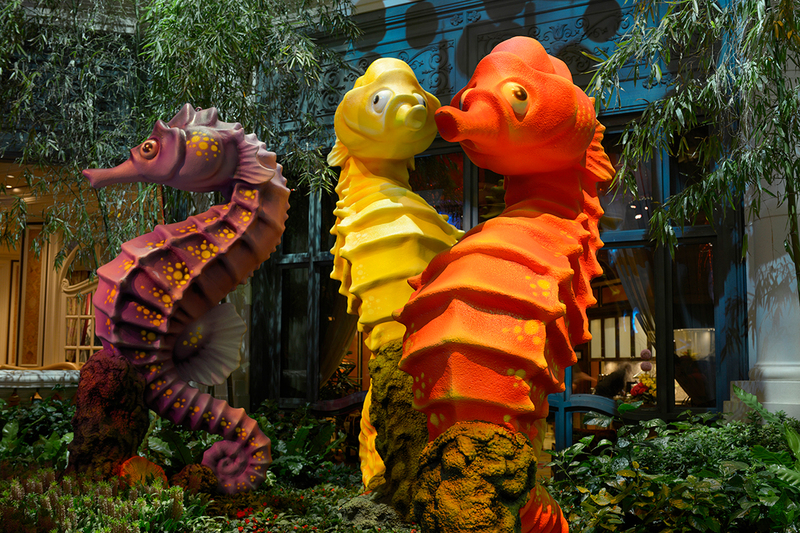 Nearby colorful seahorses of varying heights are nestled within the rocky hillside. 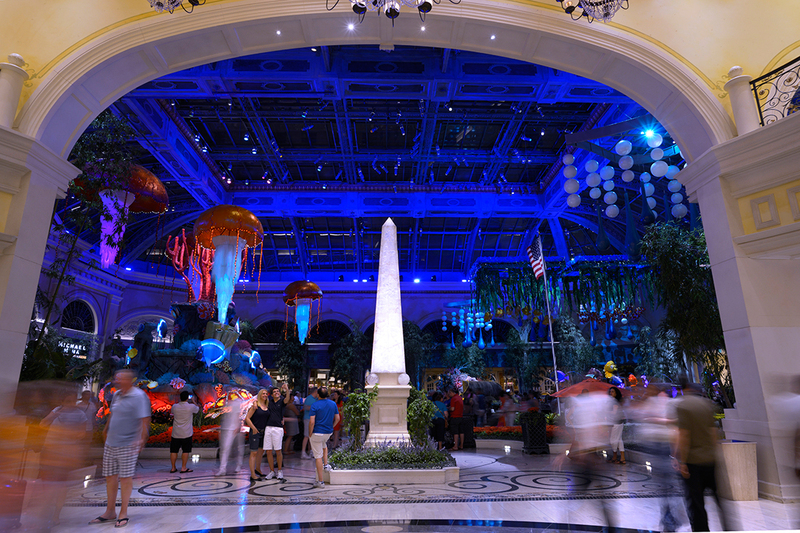 Two live 45-minute musical performances will take place daily 4:30 – 5:15 p.m. and 5:45 – 6:30 p.m., filling Bellagio’s Conservatory with varieties of jazz and symphonic harps. 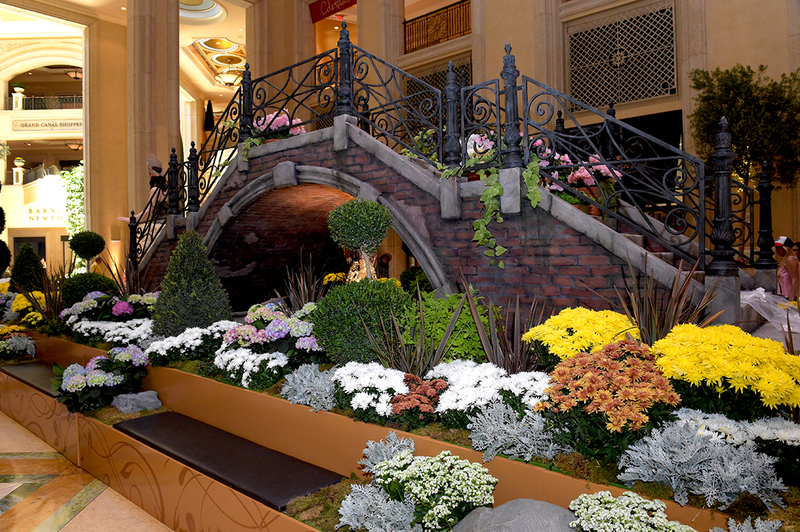 Bellagio’s Conservatory and Botanical Gardens is open 24 hours a day, seven days a week and is complimentary to the public.